This off-camera video was taken from Nintendo World being held as I type in Tokyo! The lineup is one of the most impressive I've ever seen... or at least remember. I'm really excited for Mario Kart, Paper Mario 3DS, The Legend of Zelda: Ocarina of Time 3D, Star Fox 64 3D, Kid Icarus: Uprising, Nintendogs + Cats, Animal Crossing 3D, Bomberman 3DS (looks similar to the N64 games), Super Street Fighter 4 3DS, and Professor Layton and the Mask of Miracle. It's going to be a drain to my wallet. I might have to live in a cardboard box thanks to my video game addiction! See the lineup for yourself-- direct link-style! I've decided that instead of just gathering all three Sly Cooper games of the trilogy into one review (The Sly Collection), I will review each title individually. That way you get a better sense of what's up in each of the Sly games. Plus, I don't have a Move (nor do I want one), so I wouldn't be able to review the mini-game part of the Sly Collection anyway! 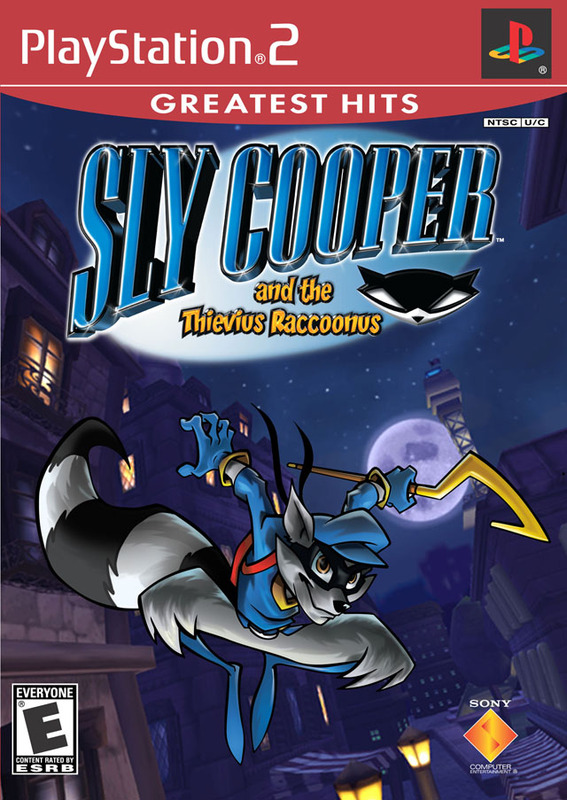 The very first Sly Cooper game was the Thievius Raccoonus, a stealth-platforming game. It's my favorite of the trilogy, and it's up first here on SuperPhillip Central! 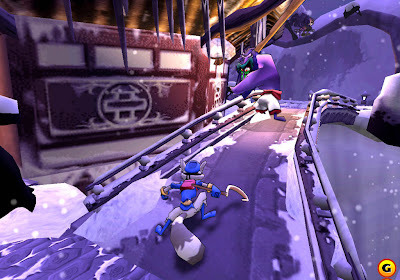 Sucker Punch wasn't a well-known developer until they came out with a clever character known as Sly Cooper. Nowadays, they're busy putting on the finishing touches on inFAMOUS 2. Let's not forget their first trilogy featuring some of the very same platforming used in the inFAMOUS series! It all started with a thieving raccoon named Sly Cooper. In this, his first platforming romp on the PlayStation 2, Sly Cooper aims to get back the missing pages of a book passed down from Cooper to Cooper (save for Mark Curry who played Mr. Cooper on TV's awesome sitcom, Hanging With Mr. Cooper). Is this title worth a look? I'll answer that immediately instead of waiting till my conclusion. Why, yes, it is. When Sly Cooper was a child, a pack of villains known as the Fiendish Five beat his father up and stole various pages from the Cooper family book, the Thievius Raccoonus. Sent off to a foster home, Sly Cooper met two new friends, a high-tech geek turtle known as Bentley, and a doofus hippo known as Murray. Together, they pledged to find the missing pieces of the Cooper family heirloom, and return it to its former glory. This means trekking across the world, taking down each member of the Fiendish Five, and restoring the pages of the Thievius Raccoonus. 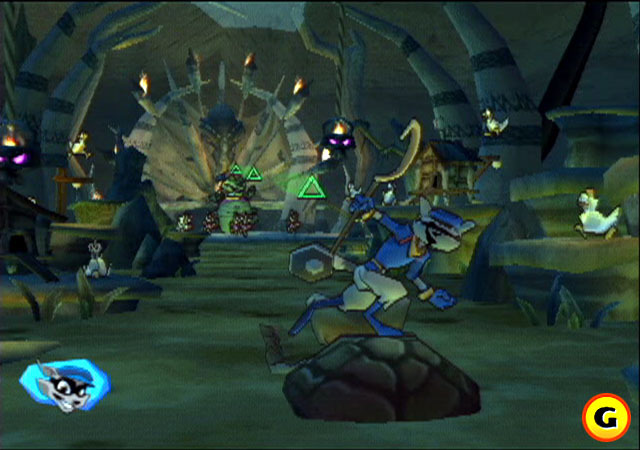 Sly Cooper starts out with players infiltrating a police officer's vault for the locations of each of the Fiendish Five. Enter Carmelita Fox, an officer who intensely pursues Sly like ticks on a dog. Escaping from Detective Fox's clutches, Cooper and the gang head to the first of the Fiendish Five. Each time Sly Cooper nears a hideout, he must platform through a level to reach the hideout itself. From there, Sly enters a hub full of enemies, levels, and a series of locks. 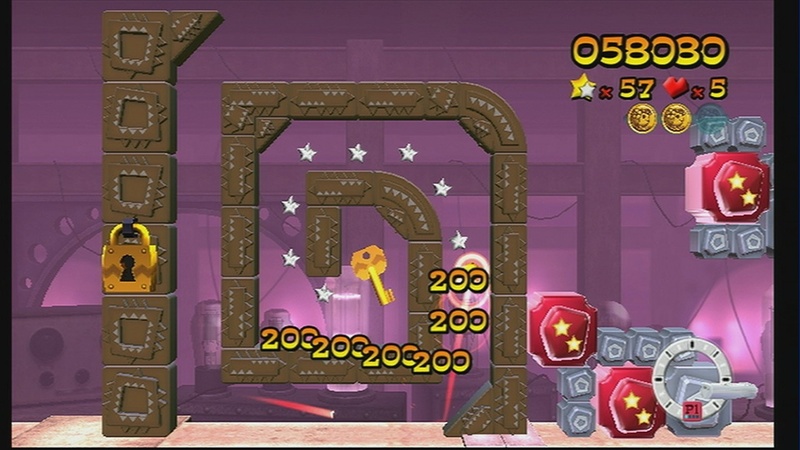 This series of locks can only be opened up acquiring keys in the game's levels. Unlock the three locks, and Sly will be able to venture deeper into that member of the Fiendish Five's hideout. Now seven keys are needed. Some enemies do not have flashlights to track Sly down with. 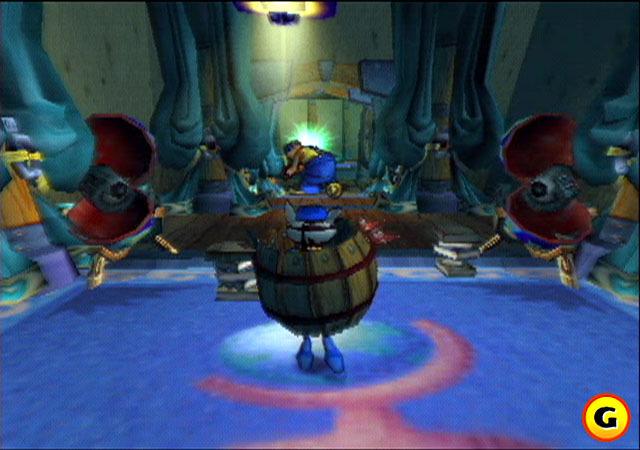 There's a variety of levels to be had in Sly Cooper and the Thievius Raccoonus. Sometimes you'll be playing a straight-up stealth-platforming level as Sly. Others are more like mini-games where you shoot crabs trying to steal treasure chests, or have Sly operating a turret from afar as Murray sneaks up on the key. The goal here is to shoot all enemies going after Murray before he gets hit. Watch your own fire though! The Sly levels are without a doubt the most fun in the game, thankfully. Sly only has one hit until he's pulverized. By collecting 100 coins, he'll gain a silver horseshoe. This silver horseshoe will give the thieving raccoon an extra hit to work with. Collect 100 more coins, and a gold horseshoe will be acquired allowing Sly three hits to work with before he's finally subdued. 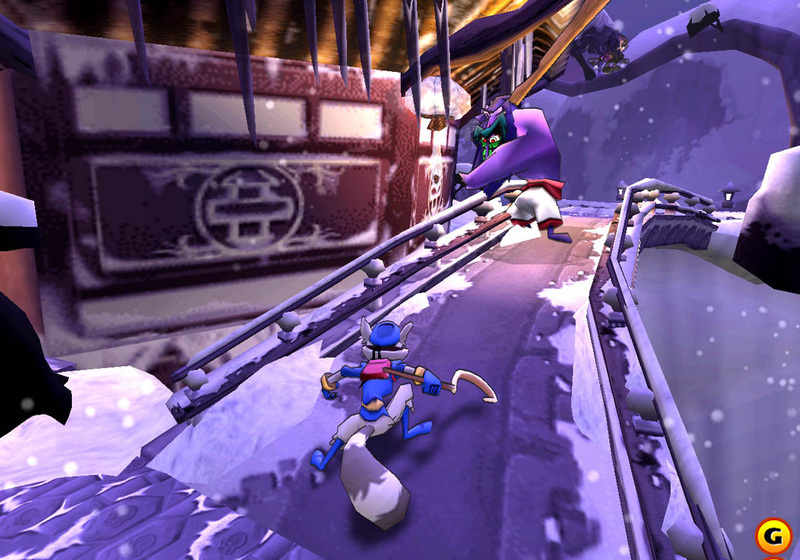 Stealth plays a big role in the Sly Cooper series. Sneaking up on enemies while hearing the bass play as Sly saunters with each footstep is a cool touch. By holding the circle button, Sly can carefully lean against walls, move around ledges, hop on the top of poles, and do a myriad of other cool stealth moves that would make Solid Snake jealous. If an enemy's flashlight crosses paths with Sly Cooper, they will alert their fellow guards or take care of Sly on their own with a machine gun or other projectile weapon. day on the job for Sly Cooper! The levels are expertly designed. One has you escaping Detective Fox who shoots at you from afar. Another has you stealthily entering a ninja compound via cliffs, dodging spotlights, infrared lasers, and much more. The other two Sly Coopers focus more on a sandbox-styled gameplay while Thievius Raccoonus relies more on slightly linear levels with dangerous enemies and obstacles. 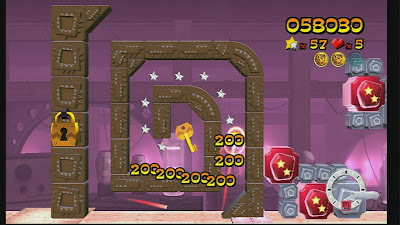 The goal of Sly's levels is to leap through the levels, dodging guards through any means necessary, to reach the key at the end of the level. Collecting keys opens up the way to one of the members of the Fiendish Five's lair where Sly will face off against them for a page of the Thievius Raccoonus. Boss battles are typically wait for the boss to finish their attack pattern, and then Sly should run up and smack them with his cane. However, some bosses deviate from this pattern. One has you hitting spotlights to shock a steroid-case bulldog into submission. Another is a game of Simon Says where pressing the right button at the right time will have Sly dodge that creature's attacks. the correct button press to dodge her attacks. Beating bosses isn't the only way to acquire pages from the torn-up Thievius Raccoonus. No, no. 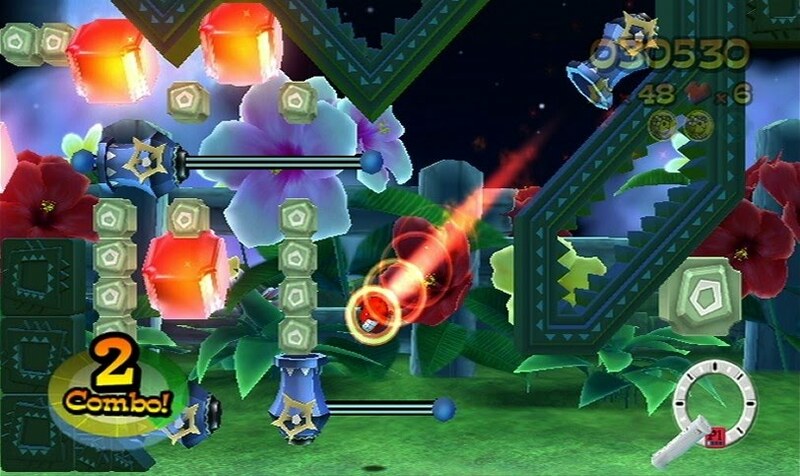 In each Sly level there are a number of hidden message bottles. Some are in plain sight while others take more ingenuity. Nothing a clever thief can't find, right? Collecting all of the bottles in a given stage will enable Sly to open up the level's safe. Bentley, through hard will and determination, will give Sly the three digit code to open the safe. Inside is a new ability or power from making decoys of Sly to trick guards to unlocking the ability to see every hidden bottle in a given stage via Sly's first-person mode. Other than Sly's levels, there's a plethora of different mini-games to play through. Murray will accidentally meet up with a racing gang who challenges him to a three-lap race around a track. This happens twice throughout the game. 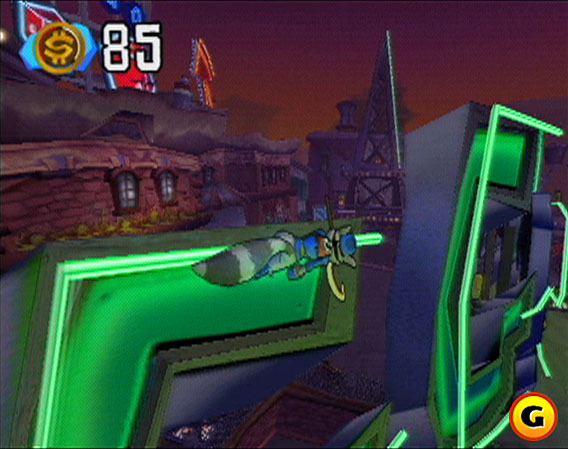 There's another game where Sly boards a hovercraft-type vehicle with turrets, and must run through the linear level without being attacked. 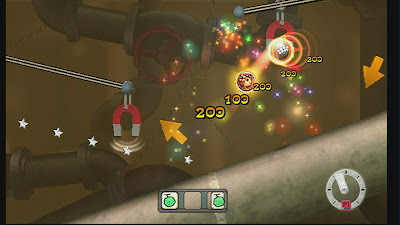 These mini-games break up any monotony that players may feel playing through Sly's levels. Some of the games are better than others, but overall they add a decent amount of change to Sly Cooper 1. There are five worlds in the Thievius Raccoonus as you might expect being the Fiendish Five and all. Each world begins with a detailed description of that Fiendish Five's history and past. The world is bookend by Detective Fox capturing the member of the Fiendish Five, and Sly Cooper and the gang barely escaping from her clutches. Visually, Sly Cooper 1 looks incredible in HD brought by the Sly Collection. The cel-shaded visuals are still impressive to this day though not as impressive as say a Wind Waker or Viewtiful Joe. There's also (for those of you rich sons of guns) the option for 3D if you have the equipment necessary. On the audio front, the music is sorely lacking. Really, the only cool part is when Sly saunters behind a bad guy and a bass line plays for each of his footsteps. The voice acting is quite good in its own cartoony way. Sound effects sound appropriate, and basically what else can you say? It's a tidy package that works well. Overall, Sly Cooper and the Thievius Raccoonus is an excellent platformer with stealth elements. The level design is extremely tremendous with hidden secrets and pathways scattered all over the place. The music may be largely forgettable and one hit kills may be unfair to some players, but the challenge and fun of the game cannot be argued. It's there, and it's mightily impressive. A great game from a formerly unknown developer, Sly Cooper and the Thievius Raccoonus is an excellent game deserving of your time and money. Just don't steal a copy like Sly Cooper would. Here we go. Now we're getting somewhere. It's the first review of 2011! While it's not a huge AAA game or whatever you kooky kids call it, it is a game that was nominated for Most Overlooked in the Best of 2010 awards. 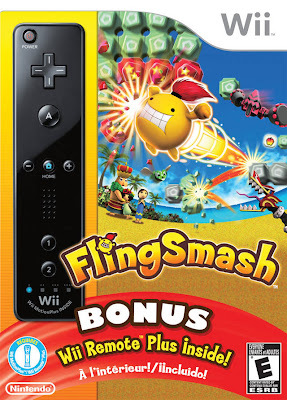 It's the Wii MotionPlus-exclusive game, FlingSmash! Fling. Smash. Yeah, that's all I got. The Wii MotionPlus accessory was announced with wide acclaim and excitement. This is the future, I would imagine Nintendo fans were shouting from the top of their lungs. Regardless, after Wii Sports Resort, the new peripheral faded away. Some games have used it, but definitely not enough to call the accessory a success (though it has sold well enough). Nonetheless, a new title has emerged, and it's essentially a ten dollar game accompanied by the all-new Wii Remote Plus that has Wii MotionPlus technology already inside the controller. This colorful new romp is known only by the name FlingSmash. Is it a smashing hit, or will you want to fling your remote in anger at the poor controls? The mystical land of Suthon Island is protected by a giant palm tree known simply as the Great Plam Tree. The spirits surrounding the tree have protected the island for centuries now. One day, an evil being known as Omninus (ominous, har, har) came to the island to take over the island's mythical power for himself. The princess of the island soon fell ill, and it seemed like all hope was lost. However, the wise elder of Suthon Island opens up a treasure chest housing the hero that will save all of the island! Meet Zip and Pip, two rambunctious heroes who will fling and smash their way through the game's twenty-four levels to take down Omninus once and for all! In FlingSmash, you visit one area of the island. These are called worlds. Each worlds has three stages to play through followed by a boss stage. The goal of each stage is to collect at least three gold medals to unlock the clam shell at the end of the level. The prize for unlocking the clam is a pearl. 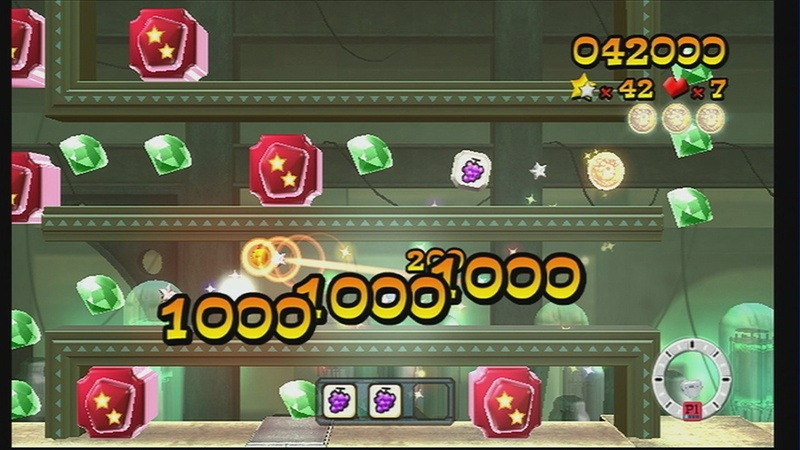 Earning all three pearls in a given world gives the player access to the boss stage. to carry you towards a higher-point route. In FlingSmash, you usually travel from right to left with the screen slowly scrolling in that direction. If you dilly-dally for too long on the edge of the screen, snake-like creatures will grab you and make you lose a life. Unlike most games where losing a life means starting the level over, Zip or Pip are placed back in the level where they lost their life. Losing all your lives means game over, obviously, so stay toward the center of the screen! Gameplay consists of smacking Zip or Pip through the game's levels. Each world introduces a new theme or gimmick. One level introduces power-ups such as the ability to split into four Zips or Pips to access multiple paths for double the points. Another makes your controlled hero grow into large proportions, taking up a sizable chunk of the screen. The Fireworks ability makes Zip or Pip explosive, destroying otherwise impenetrable walls and blocks. Every coin, star, or item collected is worth double points, so staying in a special power-up form is worth the effort. This world introduces Zip-blasting cannons. Other gimmicks include the sinister Omninus turning Zip and Pip into a heavy metal ball. This ball form can use magnets to pull your characters. Obviously since you're so heavy, you cannot jump as high or be bounced around as swiftly as if you were in regular form. 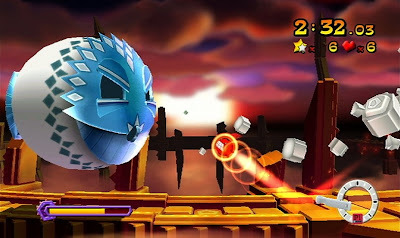 Another gimmick includes turning into a small ball which means you must charge your shots (by holding the A button before swinging the Wii remote) to break otherwise unbreakable blocks. There are problems with controlling the game. Sometimes FlingSmash registers your smack of Zip or Pip incorrectly. This is especially aggravating if you're trying to score a perfect run, and the game registers your shot going left instead of right. This just happens some of the time, and not very often, but when it does happen, it is maddening. Nonetheless, smacking Zip or Pop around the side-scrolling levels is very satisfying. This is one of those games where the title will persist that you take a break after every couple of levels or so, so be ready for that minor annoyance. Though it is recommended you take a break after awhile, because your arm can become very sore if you're really getting into the game. I know that my arm was throbbing after a two-hour session with FlingSmash! Who needs bench presses when you've got FlingSmash to work your arms? Collect those gems for even more points! In each level there's different ways to earn points. Earn enough points, and you'll earn an A or even an S rank. Getting an A rank in every level of a world unlocks a fun mini-game to play whereas acquiring an S rank in every level of a world opens up an extra stage to play through. Getting S ranks will take every fiber of your being to attain. You must collect lots of stars, play in-level mini-games to earn medals, and much more to earn S ranks. There's red blocks in levels that must be hit before the meter runs out. If the meter stays full while you're taking down the red blocks, you'll earn a combo bonus. There's also a green block that must be hit a set number of times to unlock a gold medal. You'll be frantically waving the Wii remote to take down enemies, gather stars, and destroy blocks that impede your progress. This is all the while watching out for hanging out near the edge of the screen. a barricade which blocks the way. Boss battles tend to have you attacking the weak point for massive damage (when is THAT joke going to go away?). It's usually located at the back of the boss. Meanwhile, the boss will do everything in its power to push you towards the edge of the screen to make you lose a life. They'll build up unbreakable walls of blocks to halt you in your tracks, they'll unleash a gale of wind force to blow you to the edge, or they'll simply use their body to smack you around a bit. Boss battles are enjoyable, and they break up the game well enough so it doesn't get boring. Visually, FlingSmash is a vivid delight of color. 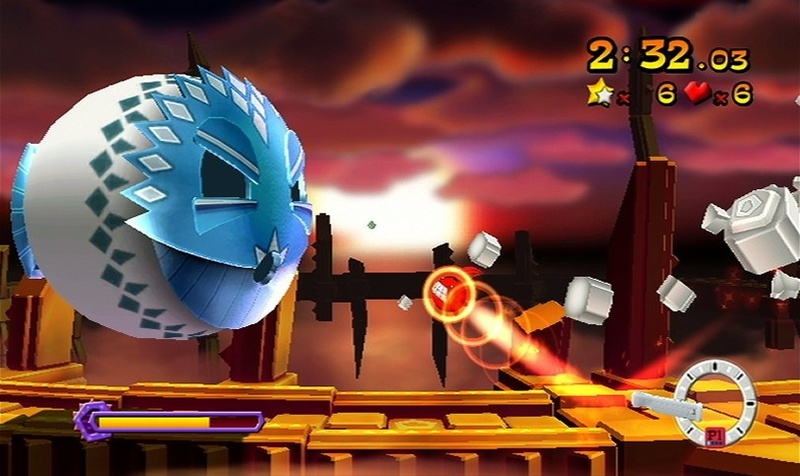 The game's levels are bright, the enemies are well-designed, and the backgrounds are full of personality. Still-frame cut-scenes with little animation tell the story of the game. Audio-wise, the music is suitable towards this type of game. The melodies can sometimes be catchy, other times not so much. Mariko Nanba from SEGA is the lead composer. He worked on several classic SEGA soundtracks such as Knuckles Chaotix for the 32X. It's a pleasure to hear his work in his decade, and it sounds so nice. For an essentially ten dollar game, the presentation isn't half-bad. FlingSmash is many things. It's a fun game, it's a tiring game, it's a sometimes frustrating game, but all-in-all it's a smash hit. It may be over sooner than you'd like, but gaining S ranks on all levels is a challenge all to itself. Going after these elusive ranks will take most players upwards of ten hours. Then there's cooperative play where you and a buddy can cut loose and play the game together, pending you have two remote with MotionPlus attached to them. FlingSmash is twenty-four levels of diversity and fun, and it's a Wii title that will definitely make quick work of your dusty Wii MotionPlus! Well, crap. We didn't have any reviews for the month of December. I hope to change that with the new year, but who knows. Damn that red ring of death and damn you, Microsoft. That's why you won nothing during my annual awards show! Make better hardware next time, Microsoft, and maybe I'll buy it. Probably not. Assholes. What was I talking about? Oh, yes. Reviews. There weren't any this month, but next month I have at least three in store for you fine readers. Until then, see you in 2011! It's a new year, but that doesn't mean the good old favorites are changing! No, in fact, they are pretty much staying the same in structure. Nor has it changed that there are five more lovely VGMs I have to share with you this week. It's been a long time since the VGMs have been around, so here we go! This theme is the theme of Fun City taking place on the second disc of Star Ocean: The Second Story/Second Evolution. The area of the game is a casino/amusement park area full of colorful shining lights and bunnies galore. C'mere, bunny! Motoi Sakuraba does a brilliant job creating the audio atmosphere to this trippy town. We return to Super Mario Galaxy with a heroic theme showcasing Mario's soon-to-be ultimate encounter with the dastardly Bowser. While this final level didn't eclipse the original Galaxy in my opinion, it still was quite good as a final level for a showdown with Bowser. Notice how the theme is more Mario overcoming Bowser than just a generic Bowser final level theme. We haven't heard from Ms. 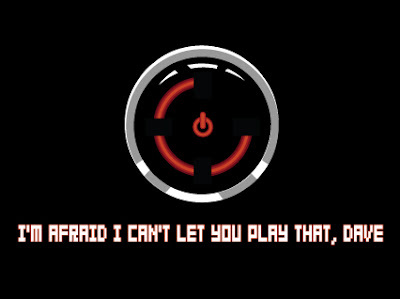 Dark in awhile, and we all know that absence makes the heart grow fonder, so here we are with a track from Perfect Dark Zero, my favorite launch title for the Xbox 360. Some call it horrid, I call it awesome-- especially the multiplayer modes. The maps were large and begged to be explored, and the single-player campaign was a joy to play-- though fiendishly difficult. This song is heard in the Subway Retrieval mission. It's Subway Retrieval - Descent. Sonic Unleashed was a half a good game. The Sonic Daytime stages were pretty good whereas the Nighttime portions of the game blew chunks to put it kindly. The soundtrack, however, was undeniably excellent with great songs and catchy beats. Such an example is Empire City's hub. This is a two-fer once again. We haven't had one of those in awhile. It's the Day and Night versions of Empire City. Enjoy. And that does it for this 2011 debut of SuperPhillip's Favorite VGMs. Join us next week where Mega Man, Squall Lionheart, and more will make their own new year's debut!